Gira's commercials and product information make one thing clear: intelligent building technology from Gira is easy to operate, extremely powerful and fun. All the films are stored together here in the media centre. 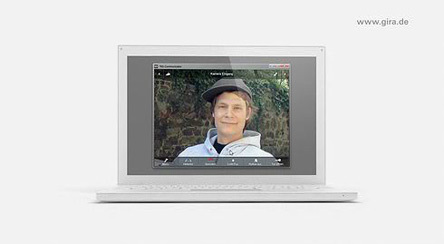 They can be easily viewed, downloaded, or integrated as videos into your own website. The key message of Gira's TV commercial is that intelligent building technology is simple, easy to operate, extremely powerful and fun to use. Find your local electrician here. You can download the Gira TV commercial here. 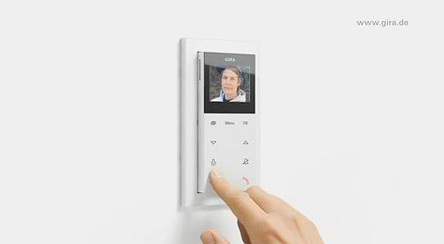 The Gira door communication system provides solutions for all indoor and outdoor requirements: door intercoms to match the Gira design lines, video function, keyless access control, flexible operating options due to integration in IP networks and much more besides. The new Gira Dual/VdS smoke alarm device has two different processes for identifying danger – making it twice as safe. It visually identifies small smoke particles before the situation gets too precarious and dangerous for people. In addition, thermal sensors measure temperature changes within the room. Gira home stations are the voice and operating units at the front door and the counterparts to the door station outside. They are available in a variety of design variants and integrated into the world of Gira design lines. Because of this, a wide range of frame variants can be combined with different colours. Just a light touch is required to operate the Gira Touchdimmer as it uses capacitive sensor technology. 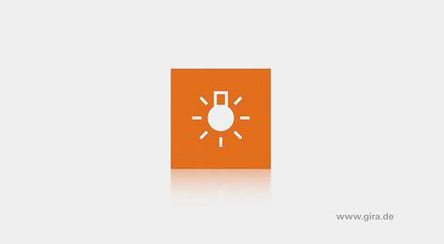 The desired brightness level can be set directly, simply by touching the appropriate LED. The last LED selected indicates the brightness level just set by lighting up. A subtle acoustic signal also provides feedback on operation. The new Gira RDS flush-mounted radio simply sits in the wall just like light switches or socket outlets. This avoids annoying cables and keeps work surfaces and counters free. Thanks to the capacitive sensor field and the high-quality display for showing information and transmitter-specific data, intuitive operation is especially convenient. The speaker has been completely redesigned to give the radio a pure sound – and in excellent stereo quality when the Gira additional speaker, which is available as an option, is connected. Gira Keyless In Fingerprint is based upon a biometric system and uses what is probably the oldest means of identification: the fingerprint. This is unique and makes it unbeatable as an entry code when used together with the latest biometric identification process. Gira is using high-frequency technology here – currently one of the most secure methods in the market for keyless entry to a building. The technology recognises the fingerprint of the deepest layers of skin, so the device works reliably even if the surface of the skin is slightly injured, if fingers are a bit dirty or if the skin structure has changed with age. The Gira Keyless In Fingerprint can even identify children's fingerprints from approximately six years old upwards, and when the finger grows and changes, the system learns and repeatedly stores the data. The Gira surface-mounted home station video offers state-of-the-art technology in the smallest of spaces: the high-resolution TFT colour display features outstanding picture quality and, thanks to capacitive sensor technology, the buttons can be operated with a light touch. The home station can be integrated into the Gira design lines, which enables a large degree of freedom in selecting colour and frame variants to match the light switch and socket outlet. 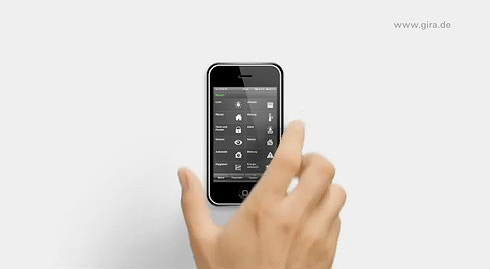 Presented with the iF product design award, the red dot award and the 2009 Plus X Award. The user interface of the Gira HomeServer® 3 controls the intelligent KNX/EIB electrical installation of a building in the simplest way possible - whether with the touch display of a Gira Client, a laptop or an iPhone. The user can adjust the lighting, blinds or the heating from a central point with just one finger – and for the entire building at that. The Gira Interface was presented with the 2008 iF gold award and the 2009 Plus X Award in honour of its design and usability.